(Bloomberg) -- An increasingly dull yuan is prompting currency traders to get more creative. The currency has been flat against the dollar since late February, with a gauge of one-month swings near the lowest in more than a year. 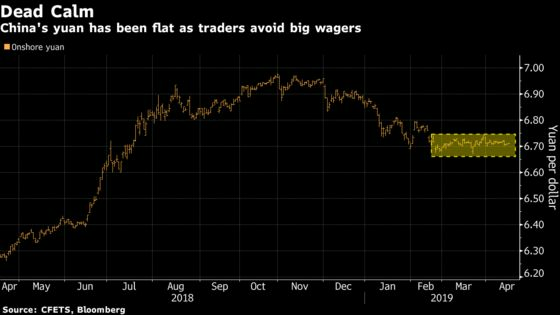 Traders have been wary of placing large wagers with China-U.S. trade talks underway, while a pledge by officials to keep it stable has also helped anchor sentiment. 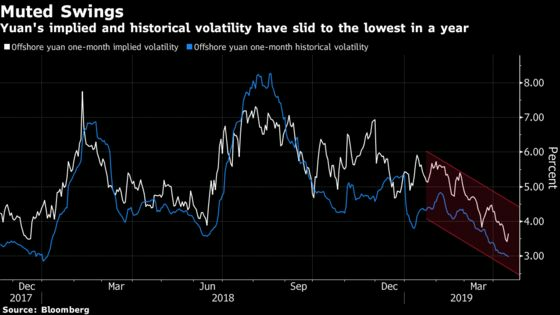 Strategists predict the yuan will continue to sit still against the dollar, with Bank of America Merrill Lynch saying in a note that "the death of volatility" has been a defining theme in the currency market this year. While that’s making life more difficult for anyone who feeds on a little turbulence, traders and strategists are now coming up with other ways to benefit from the lull. You can bet that volatility will continue to decline as the yuan holds steady around the current level of 6.7 per greenback. Teck Leng Tan, a foreign-exchange analyst at UBS Global Wealth Management’s chief investment office, says one way to do this is by selling a bullish dollar option against the yuan with a strike at 6.8. With this trade, you pocket gains if the Chinese currency doesn’t weaken beyond that level and if swings remain subdued. Here’s another wager that volatility will remain low, recommended by Huang Yuting, head of foreign-exchange trading at China Zheshang Bank Co. She says swings will remain muted throughout the year, suggesting a "short straddle" tactic that involves selling both a put and a call with the same expiration date and strike price. This produces a position that benefits if the yuan moves in a narrow range, while traders earn a fee by selling the contracts. Investors with a hunch the calmness will be short-lived can get started building bets on wilder swings ahead. One way to do this is to buy "strangle options" with tenors of more than six months because volatility may pick up after China and the U.S. reach a trade deal, said Liu Yang, vice general manager of the capital management center at Hangzhou CIEC Group Co. This strategy sees investors simultaneously buy a call with a high dollar-yuan strike price and a put with a low strike. It works as long as the yuan hits one of those levels when the options mature, which is likely given volatility may climb, Liu said. He recommends building contracts with strikes of 6.9 and 6.5 per dollar. It’d be better to wager on higher rates resulting from faster growth in inflation because it’s just too hard to make money in a currency market beset by low volatility, said two traders in Shanghai. To do this, bet that interest-rate swaps will continue to rise, said the traders, who asked not to be named as they aren’t authorized to speak to the media. The yuan’s 12-month IRS has already surged 27 basis points this month to 2.88 percent, the highest level since September.